TRS-Box now runs on the Model II and 16! Finally, a modern file management solution for the big 8″ Tandys! You can now use TRS-Box Serial on your Model II/12/16/16B/6000 microcomputers. You’ll need to be running LS-DOS 6.3.1. Check out TRS-Box Serial for more information. Use the new ENCRYPTION setting with DB SETUP to turn on encrypted transfers. TRS-Box will run much slower when encryption is turned on, but your transfers will be confidential. Now, this is not SHA-256 with RSA we’re talking about here! We’re using a 128bit lightweight encryption algorithm. That’s about the best we can do on a Z80 8bit machine and still have a useable experience. So, while your transfers are fairly confidential, you should still not transfer any data of significant value, like banking credentials. Then again, why would you do that with your TRS-80? TRS-Box is a Dropbox client for the TRS-80 Microcomputer. It allows you to navigate and copy files from and to your Dropbox from your TRS-80. It is an easy and powerful way to manage the files on your TRS-80. 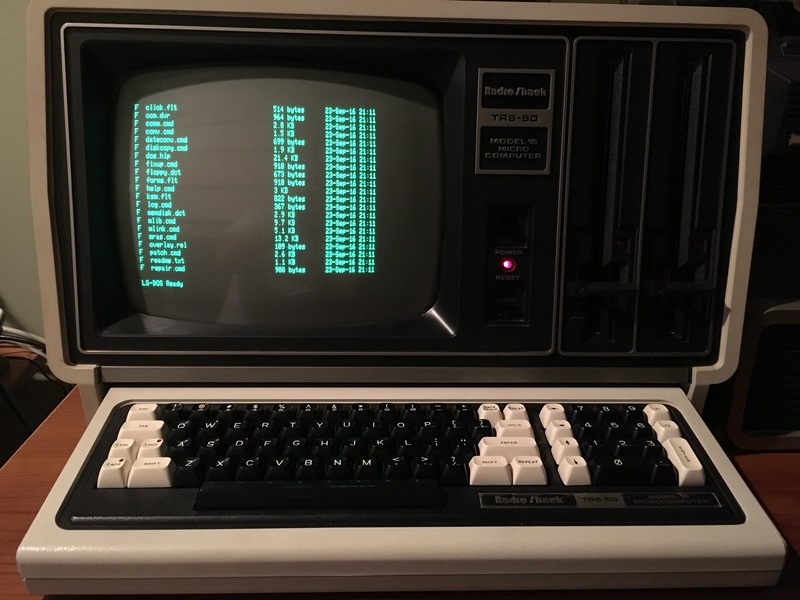 TRS-Box requires a TRS-80 Model I with MISE or a TRS-80 Model III or 4 with M3SE setup with a broadband Internet connection and a Dropbox account. If you don’t have a MISE or a M3SE, check out TRS-Box Serial. To use TRS-Box you will first log into your Dropbox account and give permission for TRS-Box to access it’s folder in your Dropbox. Authentication takes place on the secure Dropbox site so TRS-Box never has access to your Dropbox credentials. TRS-Box will only have access to its own folder found at Apps/TRS-Box. This is where you will place your TRS-80 files. Get started here and follow the directions. You can download the TRS-Box commands here trs-box-0.7.zip. Once you unzip them, you can copy the command programs to your TRS-80 using the MISE/M3SE FTPD service. Be sure to transfer using Binary mode. 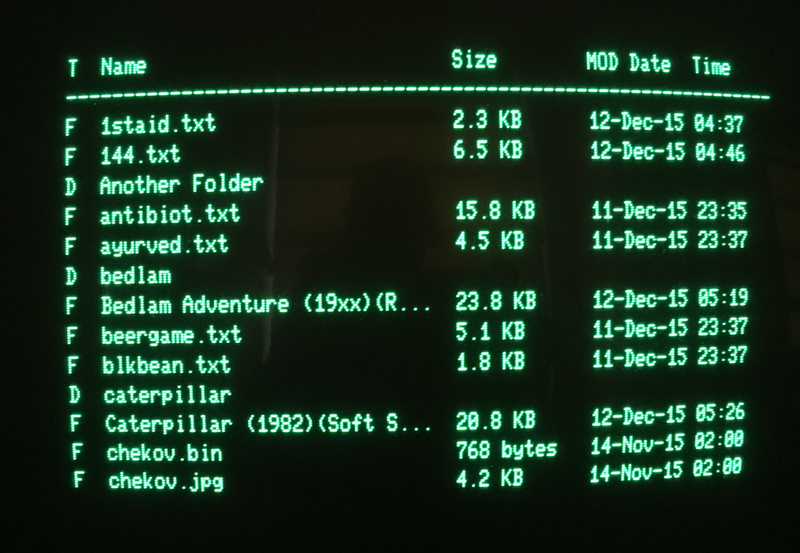 Viewing the contents of a Dropbox folder on a TRS-80 using the TRS-Box db dir command. db setup – Configures TRS-Box. db cd – Changes the current working Dropbox folder. You specify the folder to switch as a parameter. Standard directory techniques apply such as “..” to move up a folder. Use quotes when folders have a space. e.g. db cd "Another Folder"
db get – Retrieves a file from Dropbox. You specify the file name of a file in the current Dropbox folder and a TRS-80 filespec for where you want the file to be copied. db put – Copies a local TRS-80 file to Dropbox. You specify the TRS-80 filespec of a file on the TRS-80 and a filename for where you want the file to be copied in the current Dropbox folder. This is beta software and is more than likely to occasionally crash and freeze your TRS-80 from time to time. Don’t worry…a simple system reset will get you going again. If you run into problems, try getting a new token and running dbsetup again. Let me know if you continue to have issues. During beta, please don’t copy over important files without suitable backups in place. So, in the trs-box-0.7 zip file, there are files: db2, db3, db4, and a few README files. No “dbsetup” command. Everything else (e.g., the process for getting a token) seems to work fine. Any suggestions? Never mind! I just figured it out. The README file on my Win10 machine was a little funky to read… but it works! THANKS! I have all the parts for this project.The ATC Adapter, null modem cable and dropbox account. The ATC is good programmed and my Model II serial port is working oke. I can see that I send data to the server, but there is no data returned. If I try to reach the server at 54.174.42.105 with the browser I can see the data. But port 21 seems to be dead. I have collected my token several times. Is the server down ? Thanks for playing with TRS-Box! I just tested from here and it is working fine. 1. Verify your ATC is setup as: UART (8-E-1, 300 baud, No Hardware Flow Control, 0A and 0E delimiters), TCP(Client, IP: 54.174.42.105 , Port: 21, client timeout 20, server timeout 60). 2. Verify your TRS-80 “db setup” is BAUD: 0300, CONNECTION: SERIAL, ENCRYPTION: OFF, PORT: A or B. Make sure you have a device or terminator on the unused serial port. Make sure you don’t have the bi-sync modification on your Port A. 3. Verify you can access the server port from your LAN and PC: “telnet 54.174.42.105 21” you should be able to connect to the service but not do anything useful. 4. Type “db test” on the TRS-80. What happens? I could not solve the problem. I have used all the parameters you advise. At 1200, 4800, 9600 No response at all. If you choose 4800, db gives an error message. At 300 baud I always get the same response on the AD DIR command. The data is rubbish, but always exact the same data. I’ll mail the according pictures to Pete, if it is possible he can add them to my comment. My questions, does DB SETUP set the default parameters for communication on the TRS 80. I have try to modify them with SETCOM too, but this makes no difference. I have checked the serial port on the computer with a loop back connector and use port B too. I have download some files with xmodem without errors. I think my brand new ATC 1000 is bad. and I could see the directory. Changing baudrate didn’t change the results, I got the good answers on all speeds. BAD CRC THE RESPONSE IS BAD EXITING. To be sure I have used all baudrates. Changed to port B. Renew my network cable. Changed from my Model II to my Model 12 and did all the same tests, with exact the same results. THERE WAS A PROBLEM. YOU MAY NEED A NEWER VERSION OF THE CLIENT SOFTWARE. the options, I don’t know where to look now. The only thing I could not swap is the ATC 1000 as I only have one. But I have changed the setup of this device maybe 30 times, using an TCP connection without any problem. The last option is on the UART side of this device, but I can’t reproduce a communication error. Ok, it looks like the problem was that I inadvertently broke the M2 LS-DOS client when I released the last server build. I have fixed it now. Hans, let me know if it’s working now. The program is working perfect now. No problems at 9600 baud. It is a very handy tool to exchange your files. Nice to play with. Pete thanks for this handy tool.